Grocery stores are an example, for the most part, of the free-market system at work. If I want to shop for groceries, I have the choice of Wal-mart, King Sooper’s, Safeway, Target (the Super ones), or Albertsons. In my 8 or 9 years of grocery shopping, food costs have not gone out of control. They have increased, but they seem to follow inflation somewhat. I don’t know the stats, but that’s my experience. I think most people agree that they would rather have private grocery stores provide food as opposed to a central government office. Long food lines as seen in the Soviet Union show the results of a planned economy. However, even if the free market provides lower prices and more options, there will still be some people who simply can’t afford food. However, there are programs to address this, such as WIC and food stamps. In a way, this can be seen as a compromise or best of both worlds; the free-market system is allowed to work to produce low prices and high quality, but certain programs are in place to ensure that people get to eat. I’m not saying the current system is perfect; people still have it rough, but there is not a large amount of the population starving. What we don’t do is totally revamp the way grocery stores are operated and have the government run them so that everyone can eat. However, this is what we want to do with health care. Now, I can understand why we treat health care differently. Health insurance premiums have been sky-rocketing for some time. However, the medical and insurance companies are already some of the most regulated industries in the country, so it seems unfair to blame failures on the free market when that particular part of the market is not that free. Now, I know many liberals will think this is a convenient argument, “if only the market were more free, then everything would be alright.” But so is the argument “if only government would do more, if only there was more funding.” So what do we do? Well, let’s look at the pattern of other industries and other government departments. For instance, with public schools, we spend more and more per pupil, yet see diminishing returns. Meanwhile, people are gobbling up the chance at Charter Schools, schools that are still publicly funded yet offer parents some choice, mimicing the market to some extent. The service, even at Wal-Mart, is far superior to the DMV. I’ve never spent an hour at Wal-Mart waiting in line. If I don’t like my experience at Wal-Mart, I can go somewhere else. Wal-Mart is open on weekends. The DMV, on the other hand, has no motivation to help me out. Sometimes they are only open four days in the week; why stay open five, am I going to go to another DMV? Other areas of technology have brought us rapidly improving products at dramatically lower prices; your iPod has much more hard drive space than many earlier computers the size of your bedroom. My point is, in many areas of the free market, we see improving quality at lower prices (there are exceptions, such as oil, but a limited good will have a high price in any system). The ones that are heavily regulated and/or funded, such as our school system and health care, we see higher and higher prices for diminishing returns. Furthermore, the lowest employee at the DMV holds way more power over my life than anyone I will meet at the grocery store. I don’t want to get into the debate right now about whether or not the media has a liberal slant or not, but I do believe that news stories tend to favor more taxes and government funding. The reason I say this is that the local and national news will often focus on how lack of government funding hurts this or that program. That’s fine, but I wish they would focus on the other side as well, how higher taxes and fees can hurt people as well. Case in point: our cat ran away earlier this week. We are usually really careful keeping the cat inside, because cats have a somewhat shorter life span being outdoor cats, at least in our area of Colorado, due to foxes, coyotes, and the like. Anyway, our cat ran away, and my wife found his picture on the humane society website. She goes to pick up the cat, and due to a new license law passed for cats this month, getting the cat back was more expensive. The thing is, it seems somewhat unlikely that the news will report on the probability that there will be fewer adopted pets and even claimed pets due to a higher adoption cost, whereas we would likely see a story about how the humane society is struggling due to lack of funding and how the city or state needs to fund them more. I’m not saying the license law should or shouldn’t be passed, I just think the news needs to look at the apparent good and bad of what government does. We here about how schools need to be funded more or how these people are suffering because some government program is not in place, but we never hear about the mountain of regulation businesses face or how some poor person can’t practice their trade because of certain licensing laws. We hear about the high price of gas at the pump and how corporations are making so much profit, but it is rarely talked about how government makes more at the pump than anyone. I don’t quite understand this slant in reporting. Maybe it is because people naturally think that anytime something bad happens, government should ensure that that bad thing never happens again. I think the news caters to this. The church, specifically the American church, is typically a source of criticism, by those inside and outside the church. I will address those right now within the church. Now, the American church is far from perfect, it is made up of imperfect people, like me. So the church is not above criticism, and it is each member’s duty to strengthen the body; sometimes that will involve criticism and conflict. At the same time, however, criticizing the church has almost become a cool pastime for Christians. It almost becomes a punching bag. Here’s the thing though, the church is my family. So when you criticize the church, you are criticizing my family, and yours as well. Yes, the church needs to constantly be better, and I know I’ve often talked about things that need to improve. But I see the people who are in leadership at my church. They are good people, good-hearted people. No, they don’t have everything figured out, but they are, for the most part, trying their best. The point is, when you criticize the church, you are not just criticizing some faceless and remote institution. You are criticizing the people who pour their heart and soul into the church, whether they are paid staff or people who volunteer. They are real people, staying up late nights printing church bulletins or making signs, or people who are making decisions about who to lay off so they don’t cut out essential ministries. The church is not evil, and the church does not represent everything that is wrong with American Christianity, as Christians often think it is ( and I suppose non-Christians as well). It may be cool to bash the church, but guess what, the church is us. Whatever standard to which you hold the church you should also hold yourself. If you criticize the church in how they handle their money, you should look at your own financial decisions. If you criticize their priorities in ministry, it is only fair to look at your own. Again, there is nothing wrong with criticizing the church and pointing out where we, as a Christian body need to improve, just keep in mind that the church is composed of real people, and that it is composed of you and I.
I like Subway, and I think it’s great that there is a healthy alternative to fast food that is also fast and inexpensive (although it would be nice if they had drive thru). However, I’m not a big fan of their commercials. Last I checked, it was still mean to make fun of people being overweight. 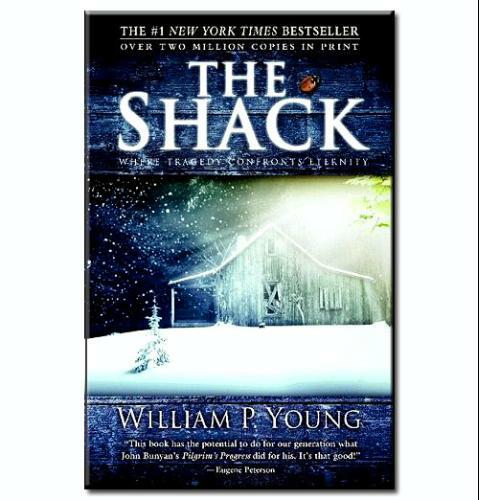 I just finished reading The Shack by Wm. Paul Young. The book is about a man named Mack who experiences a terrible tragedy – his little girl dissappears and is presumed to be murdered by a serial killer. Four years later, he is invited to meet God in The Shack where the crime occurred. In the book, Mack essentially meets the trinity of God, representing by three individuals. God the Father is represented as a black woman, the Holy Spirit is this Asian woman, and Jesus, is represented by none other than Jesus, a middle eastern handyman and woodworker. The book is ambitious as it attempts to tackle some big themes, the central one probably being, “why does God let bad things happen?”, a question first recorded in the days of Job. This question is explored deeply, as Mack doesn’t understand how God lets such a terrible thing happen to his youngest daughter. While people familiar with Christian apologetics have heard many of the answers to this question before, the book does provide a fresh perspective even if only because the book addresses these questions in a fiction format. The book also touches on other important topics of Christianity, such as being saved by God’s grace as opposed to being saved by our works, being empowered and guided by the Holy Spirit to live the Christian life, and the need to forgive others. The book speaks frequently about the emptiness of religion and the need to focus on a relationship, which is an important topic, but it does sound a bit cliche at times. I think it is good to attack the idea of “going through the motions” religion, but sometimes I wonder if this attitude doesn’t develop in which we think any church that isn’t as “free spirited” as we are is “empty”. I think it is good that Christians question and even make fun of themselves, I just don’t want it to get to the point where we think our church is a shallow institution simply because the elders hold meetings every week. Christians, or anyone for that matter, needs to take this book for what it is: a work of fiction. This book is quite bold, very few people are willing to provide embodiments of each member of the Trinity and give them extensive roles in a book, with direct dialog and all. As expected, this work has received some criticism from notable Christians, saying it is unscriptural. The book has the members of the Trinity make several statements that I think are ungrounded in scriptural theology. I am not saying they are necessarily wrong, but they are not necessarily right in the since that they cannot be inferred from the Bible, at least right away. If I was to study the book in depth, perhaps I could draw the connections, but I didn’t do so right away at first read. I don’t see the doctrine of universalism that some others see, it seems that the book makes an effort to refute this, but I would have to reread it to see if there is something I missed. With some of the major themes, I think the theology is intact, namely, what Christ’s sacrifice accomplished, the role of the Holy Spirit, the nature of God’s love. Concerning the nature of the Trinity as presented in this book, again a subject of criticism by some biblical scholars, I personally see it differently. By definition, God as human is Jesus Christ, so God the Father in human form <i>would be</i> God the Son. God the Holy Spirit would not be in human form, because then, by definition, it wouldn’t be <i>the Spirit</i> it would be a body. But then again, I see the effect the author is going for; he wanted to explore the nature of each part of the Trinity, and for his book, it is easier to do so with each member represented as a human. I suppose if God wanted to present himself as three humans, he could very well do so. Also, some people may take issue with God the Father being represented as a woman. I won’t address the issue too much here; I do believe God has masculine and feminine characteristics that have been passed down to humans, male and female, respectively, and also that he has chosen to represent himself as masculine in the Father and Son. I’m not one to say if he would appear as a woman or not. In summary, it was a worthwhile read for me. The book provides a fresh look at some important themes in Christianity and at the universal question of suffering. As mentioned previously, the book explores some philosophical constructs that don’t seem to have a firm foundation in scripture as I would like. Again, the reader will have to be aware that this is a work of fiction and not a theological treatise. I think a reader quite familiar with the Bible can take away the good and leave out the questionable. I have blogged about the whole idea of conservatives caring about the unborn after they are born here and here. And to be fair, I see the pro-choicers’ point. People who are truly passionate about the pro-life issue should not only attack it from a criminalization perspective. The whole issue of abortion is more than “don’t do it.” As my pastor pointed out, if an unwed expectant mother comes into the church and says she is thinking about an abortion, the church should not simply respond with “don’t do it.” The church should be there to help and support her. Christianity is more than simply saying “this is wrong”, it is about caring for people. Now, don’t get me wrong. Pro-choicers will use someone’s stance on other issues in order to undermine their pro-life stance. They will say that someone has no right to oppose abortion unless they agree with them on socialized health care, welfare, etc… You must not only care for the unborn after they are born, but you must do so in exactly the way they say ( you know, the whole argument about conservatives not caring about the poor since they don’t support welfare to the degree they do, etcetera, etcetera ). But, if abortion is only tackled through the political arena, then I think it is – I will speak to the Christians here – Christians simply spouting off “this is okay and that is wrong” instead of being involved and helping the people in the situations. It is a combination of truth and grace – loving others yet sticking to what one believes is right. No one ever has to apologize for choosing on the side of life in any instance, but I can understand that if someone is pro-life yet doesn’t care about helping the mother or the unborn child, abortion simply becomes an issue in which we take our side and stand on our soapbox, instead of actually becoming involved.